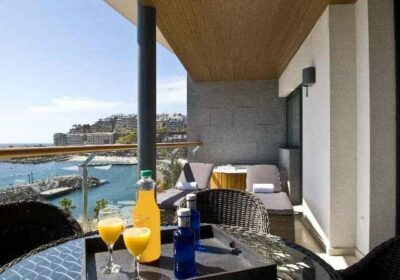 Radisson Blu Resort Gran Canaria Hotel, Arguineguin, Gran Canaria, Free Child Places Gran Canaria. The beautiful Radisson Blu Resort Gran Canaria, 5 star Hotel is well located and offers some fantastic views of the Atlantic Ocean. Location is shown as Puerto Mogan by some Tour Operators. The hotel offers spotlessly clean, spacious apartments, with a full kitchen. Amazing Sea Views. Friendly and helpful staff. Choice of swimming pools. The hotel is surrounded by 3 beautiful beaches and is close to the village of Arguineguin. The resort of Arguineguin is approx 47km from Gran Canaria Airport. There are 189 rooms spread over 11 floors, all of which feature private bathroom, hairdryer, bathrobes, slippers, internet access, Sat TV, direct dial telephone, mini bar, iron/ironing board, safe, air conditioning and private balcony. The many facilities on offer include 24 hour reception, currency exchange facilities, conference room, gift shop, supermarket, wireless internet access, room and laundry facilities, grill restaurant, pool bar and car parking. Leisure facilities include paddle tennis, tennis court, direct beach access, fresh water and salt water swimming pools, fitness centre and onsite spa.